For those of unfamiliar with Windmill’s Swiss format of scheduling games, a quick explanation: instead of being dictated by seeding and pools, each team is assigned an opponent with a similar record and point differential (after the initial round where teams just play their matched seed, #1 v #16, #2 v #15, ect.). For example, a 1-1 team will play another team with the same record. The next round all of the 3-0, 2-1, 1-2, and 0-3 teams play each other until the top eight teams are sorted out after the 5th round of play. The idea is to match equal teams as early in the possible during rounds to give every team the most quality games. For a more complete breakdown of how the scoring system works, check out the full explanation on the Windmill Leaguevine site. As a veteran of American tournaments I feel a gust of fresh air with the ultimate scene here in Amsterdam. The Swiss draw format alone brings a new level of importance and excitement. 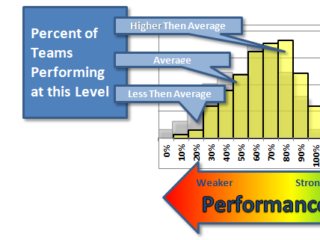 Every point matters, and since teams don’t know their next match-up until the end of the game, it keeps players in the moment. The difference between making the championship bracket and coming in 9th could come down to just one point. Perhaps this is just the atmosphere bred at Windmill, but the closeness one starts to feel to all the players is quite unique to the sometimes cliquey tournaments in America. Here, players eat, drink, sleep and dance with their opponents at every meal. It takes respecting one’s adversary to the next level and is a welcome feeling for all participating. Wind did play a large factor today for all divisions. Gusts and irregular swirls made zones extremely effective. Deep shots were inconsistent and often looked off. However, that didn’t always necessarily result in long points due to excessive turnovers. Instead, points were punctuated by long, patient offensive movement up the field. I was blown away (har-har, wind pun) by the level of discipline these European teams displayed in their zone offenses, and not only in the top four teams. All the way down, handlers showed poise and tranquility in the face of cups, traps, and gusting winds. Offensive systems were in place, spaced correctly and adhered to when they worked, changed when they didn’t. Dominant play in the Women’s division today came from Lotus and Hot Beaches. Those top two teams were closely followed by Lay D’s, Copenhagen Hucks, Woodchicas and a host of others. Lotus and Hot Beaches are the only two teams still undefeated in the women’s division, and only one team has lost all three rounds so far. It goes a long way to to show the tightness of competition and bounty of talent. The top four teams are on their way to chiseling their way to the semis, but slots 4-8 are for grabs. Tomorrow will show who has the guts to make the quarterfinals. Lotus (Switzerland) – Easily the most put together squad I had the opportunity to watch today. A shoe-in for the semifinals at least, these ladies were unphased by the wind as their handlers sliced back and forth across the field. Their knowledge and execution of zone offense puts them on a different plain than the other teams here. Lotus stacked up points against Woodchicas and Purple Rhino (an international pick up team), defeating both 15-8 and the Swiss don’t seem to be slowing their roll any time soon. I could easily see Lotus performing well at an elite womens tournament in the states and have to laud this European team in promoting such high level of play without sacrificing any amount of camaraderie or spirit. 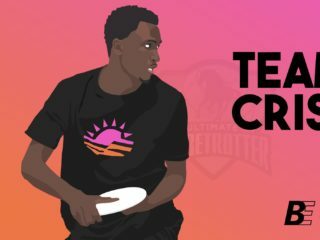 Hot Beaches (Czech Republic) – Comprised of veterans of the Prague ultimate scene with a few Austrian pick ups, this team lives by its crafty throws and amazing grabs. 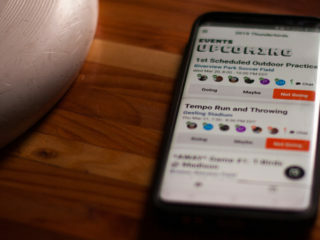 The only other team to go undefeated on the day, the Hot Beaches put long runs of difficult throws and catches together to frustrate even experienced defenses. It will be interesting if they can keep their streak alive against the Swiss. Women on Fire (Germany) – A team that unfortunately went 0-3 on the day, but that also looks like a blast to play for. Germany’s Women’s Masters Captain Valeska Schacht anchors the mix of ladies. CUSB (Italy) – My preview reports of this team being tenacious and athletic were confirmed today. 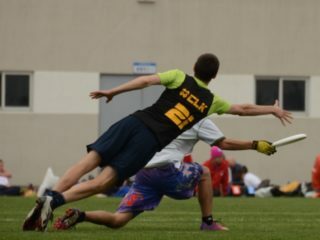 I witnessed three or four layout scores by the Italians and an ability and desire to get physical on defense every point. While many teams struggled with the wind, throws by Francesca Sorrenti were pin point and CUSB’s Laura Farfoli could not be contained today. Whether it was an athletic block or contorted catch, this captain ran this team’s defense into the next level. With the young, clamping four person cup as their defensive look, this team could make a run at the finals. Heidees (Germany) – I didn’t catch a lot of the Heidees today, but I would be not surprised at all to see them creep into the late stages of this tournament. At first glance, one might write these ladies off as a middle-of-the pack contender, but, there is a fire in this team, especially on transitions. Following a goal line stand against CUSB, the Heidees ran the full field in a matter of 5 throws hitting different receivers. Opponents beware: This team has a second gear. Germany U20 Women (Germany) – Hailing from all regions of Germany, this U20 national team is everything you would expect from a junior squad. Green and unpolished, maybe. But they have the ability to run all game, surprise opponents with athleticism and celebrate every success large or small. As the only junior team in the women’s division, Coach Marco Mueller said he wanted to attend a tournament “where the level is higher, where the intensity is higher” in preparation for the European Youth Championship, and also scout for talent for the Germany 2014 Junior Worlds team. They placed fourth at 2012 Junior Worlds games and have their sights set on medalling soon. This weekend the girls are focusing on “good matchups” and playing an intense, complete game. U de Cologne(Germany) – This team formed out of 2 clubs only a year ago and in their first season they are already finding the success of a team with years of chemistry. These impeccably tight-knit ladies make every throw and cut as crisp as possible. With their only loss a 13-15 fall to the Czech team Hot Beaches, expect to be seeing more from them throughout the weekend. 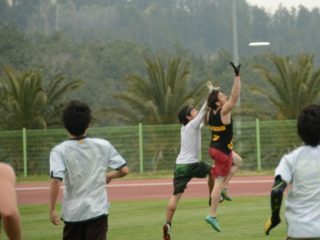 Lemongrass (Russia) – Going 1-2 on the day doesn’t accurately reflect the potential in this team. It should also be noted they are short on their normal roster for this event. Lemongrass has moments of lightning fast flow and are able to bounce from timed cut to timed cut, but the occasional errant throw breaks up their concentration. As their younger players develop confidence and more of a field presence, Lemongrass could take off in a big way. To top off their potential, after the game and a half I saw I would easily place Nastya Parfenchikova in the top seven women players in attendance at Windmill.